Strobing is a thing now. Apparently. It's the latest Summer trend. To replace the crowned 'contour' trend of 2014. I don't care for contour on most days, it's just for formal occasions when you want to look way more attractive. Most days, I stick to highlighter. Imagine my exasperation when all the new sites and all my friends started raving about strobing. A technique used to create a dewy, shiny glow to the skin that looks almost unreal. Which it is. I have thrown a fan brush across the room and screamed 'It's highlighting!' at least once. So here is an easy tutorial on how to get that ethereal glow to the skin! 1 | After priming your face with Benefit the POREfessional Face Primer, slap it with Revlon ColorStay Foundation in 150 Buff. Keep it on using Essence All About Matt! Fixing Compact Powder. Your face does not need to be matte like mine, and you can use a dewy foundation for the extra oily effect. 2 | Apply a highlighter to the high points of your face. I'm using Benefit High Beam but you can use any shimmery cream or powder product lighter than your skin. 3 | Prominent high points of your face are : cheekbones, bridge of the nose, arch of the brow, brow bone, corner of the eye, cupid's bow, chin, and forehead. Pick three or all or death. Your choice. 4 | Blend using a damp sponge or your fingers. Or simultaneously. A damp sponge blends the highlighter to look natural, your fingers help prevent streaks. 5 | You can stop here but that would just be regular ol' highlighting and we don't want that. We want our faces so shiny, the moon is jealous. 6 | Taking Essence Soo Glow! Cream to Powder Highlighter in 10 Look On The Bright Side on a blending brush, blend it into the high points. Your glow would be so bright, you emulate the sun. 7 | Blend the product into your skin with a damp sponge. We don't want to overpower the sun. It provides warmth under its rays. You just provide beauty. 8 | Apply Essence Silky Touch Blush in 050 Sweetheart onto your cheeks, focusing on the cheekbones. Apply any left on the brush on your chin and nose. Think natural sunburn. 9 | You're done! A Not-So-Subtle glow for any occasion. You are a beautiful sweaty angel. Now cover your face up or else you'll blind anyone who looks at you. Jokes aside, Strobing is a fun and easy way to give an extremely youthful look to your skin. Some people enjoy it, some don't. It's okay. You should try it at least once to see. I wouldn't do this regularly but I have a few friends who have incorporated this into their daily makeup. I hope you enjoy the tutorial, and found it easy to follow along. Even though I might not understand it myself. Half-Asleep Bash is difficult to understand, slurring and babbling almost as much as Anemic Bash. If you want to see more, please follow me on bloglovin' since I will be posting a few more makeup looks soon! So will you try out strobing? What do you think of this new trend? looking great! I've been doing this everyday but now its called strobing? hahaha go figure. Im loving the strobing trend, its so pretty for summer, you look stunning! I agree with you girl, strobbing is just another name for highlighting. Trends are always come and go but each time with different names. You look stunning you beautiful sweaty angel lol. So true! I've had High Beam by Benefit and didn't use it back in the days, just because I didn't know HOW to use it! But thanks to this tutorial I head over heels to try it again! Love this old "new" trend! ;D Well done, Bash! Have a fab weekend, honey! That has made such a difference! When I use highlighter, this is pretty much what I do so it's good to know I'm doing something right! Fab tutorial - you've made it look so easy! Your references to the moon and sun cracked me up, haha. You look wonderful! (Also, you don't need contour at all, because hello, natural prominent cheekbones right there!) I love some intense highlighting so I'll most likely be wearing this look. Can't wait for more of your makeup looks! Such a great tutorial! You look amazing! I'm so out of the look that I didn't know strobing was a thing lol. It looks so good on you though! I usually don't commit that much time to my makeup, but I might have to try out your tutorial one of these days. So,.. is there really a difference between high-lighting and strobing? Oooh, I've heard a bit about this strobing technique, good to see it in action! You did a good job with the application, looks fantastic! Love the step by step, you look amazing in every photo! Ooooh, it looks snazzy! I literally have no idea what it is as this mug doesn't suit make-up at all, but great to see how you did it! hahaha, nice tutorial, you should watch Jackie Aina's rendition of the strobing tutorial, it's awesome. You look so lovely! Really good tutorial! I'm going to try this! Great tutorial and I love how glowing your skin looks! I think you look so pretty in all photos!! thanks for this amazing tutorial, I definitely must try this!! Wow, this is amazing. I've never heard of this before but now I want to try it!! Oooo, it does look pretty! I love the dewy effect! I love this tutorial! It looks AMAZING once done, I need to try this! I havent really tried strobing but it looks really interesting and way easier than contouring. Oh my gosh, you have the most amazing cheekbones ever! So jealous. Love that lip color as well, and the tutorial was really easy to follow, although I have to admit I'm probably way too lazy to ever even attempt it. Either way this look gorgeous on you! I had seriously never heard of this but you look amazing and now I need some highlighter so I can give this a go! lol this whole time i didn't even know what the trend was called! anyways great tutorial. you are gorgeous!! Very cool tutorial and my god you are so pretty! Step1. Be naturally gorgeous and have the cheek bones of a goddess! You look amazing! You are gorgeous! I would love to give this a try! I've always wanted to learn basic contouring, but it seems like so much work, and I'm a little intimidated by it. I currently use a foundation that makes my skin look dewy, so maybe this will be a good look for me? We will see, I guess! Love your tutorial, you look gorgeous . I like this trend but i don't love it. I'm from a place with hot weather and a lot of humidity and also I have oily face so this was my regular look without the need of any highlighter or makeup product, now that i live in a cold place I kind of enjoy my matte face . Flawless! Such a great tutorial! Wow, you look beautiful!! (as usual). I have never even heard of this. I like the darker lip on you too. Hahahahahha I know how you feel. "Strobing?" Ridiculous hahaha for simple highlighting. Love that you rock the highlights! I usually contour on a normal day, but I skip the highlight, which is like the opposite of what you do, haha. You look stunning. I love the styling of these photos as well. Love this! I've never heard of strobing. Just started contouring not too long ago. Will have to try this. great tutorial! I love your lipstick color! I really like your tutorial, it looks easy and the effect is stunning :) Thanks for sharing it, Bash! Thanks for this tutorial, dear! You are so beautiful <3 Love the makeup! Great tutorial!! You look flawless! Can I just say that your skin is positively flawless! Good job on the tutorial and very nice pictures. I use some of the products you're using too. 3. I think you just gained a new reader !! Keep the good blogging up! Hi love! I hope you had a great weekend! You look absolutely beautiful today, as always! Love your make-up routine post! Girl you are hilarious! I'll have to check out the benefit and essence products. It looks great for pictures, but does it look natural in person? Great tutorial, this color looks great on you. Great tutorial! That highlighter looks amazing on you! Great tutorial, love the bright lip and neutral make up! I haven't tried but I am definitely going to.Since it's the new talk of the town. Even if it wasn't, it still looks so lively. 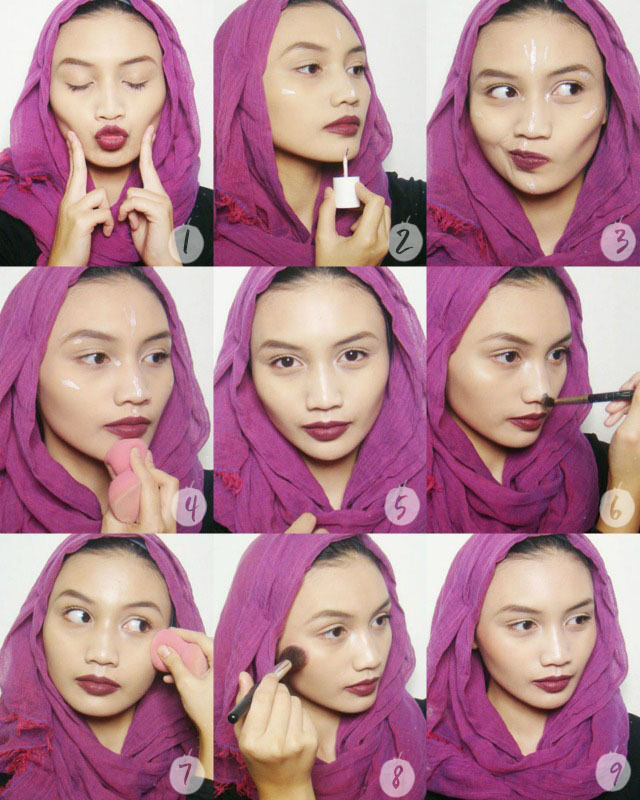 Thanks for sharing this make up tutorial on glowing skin. You always have such flawless skin. I think it looks great on you. You look amazing! :) Love this tutorial, too! loved the natural look you created. Beautiful natural make-up! I really love the High Beam from Benefit! I had never heard of strobing before until I came across this post. You're right, it's highlighting. Why can't it just be called highlighting? Ah well, with my naughty combination skin I will look like I'm 'strobing' at the end of the day. There has to be some upsides to having oily skin, right? I've actually never heard of this before! It seems like it's pretty much just highlighting, but whatever you call it you look GORGEOUS! lovely makeup look, really want highbeam now! It might not be something I will ever try as my skin is as pale as most highligthers, so I'm still on the contouring-thing. It looks great on you though! You should definitely do this more! I've always been too scared to try this out as it looks a bit too much for me. But you pull it off well without applying a lot! its encouraged me to experiment this type of look too! Well, doesn't this just make it all look and sound so easy, this is so great. I have to agree, "It's just highlighting!" That's my initial reaction too aha. I love strobing. You look amazing!